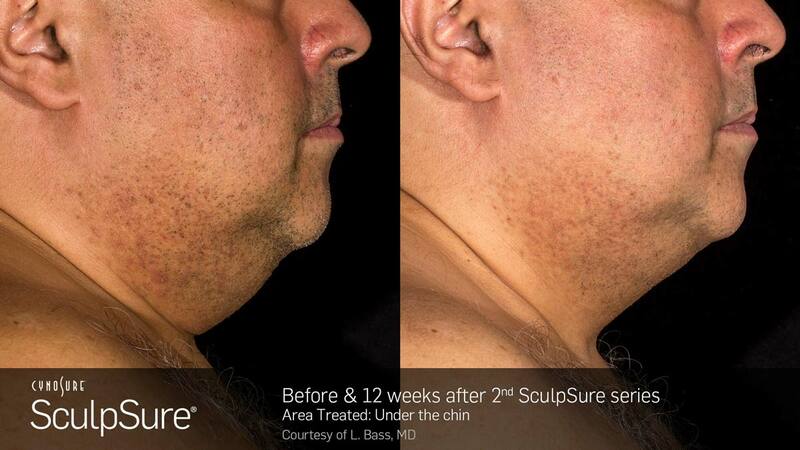 SculpSure for chin, neck and jawline is a fat reduction treatment is available at New Radiance Cosmetic Centers! Accumulation of excess fat under the chin – the submental region of the face – affects people of all ages. Submental fat is commonly known as a “double chin” or a “turkey neck”. This submental fat can cause much frustration with a person’s overall appearance since neither diet nor exercise may work to reduce that selfie-killing “wattle”. After your SculpSure for Chin treatment, we'll give you one free Exilis Ultra skin tightening treatment to tighten up loose submental skin (12 weeks after SculpSure for chin). Special Offer $200 Off is limited to the first 20 treatments booked. Even adults that are height to weight proportionate can develop a double chin. Fact: the chin is an area of the body that is known as a haven for tenacious fat cells. Fortunately, the latest advancements in SculpSure chin fat reduction technology efficiently target and eliminate stubborn submental fat. 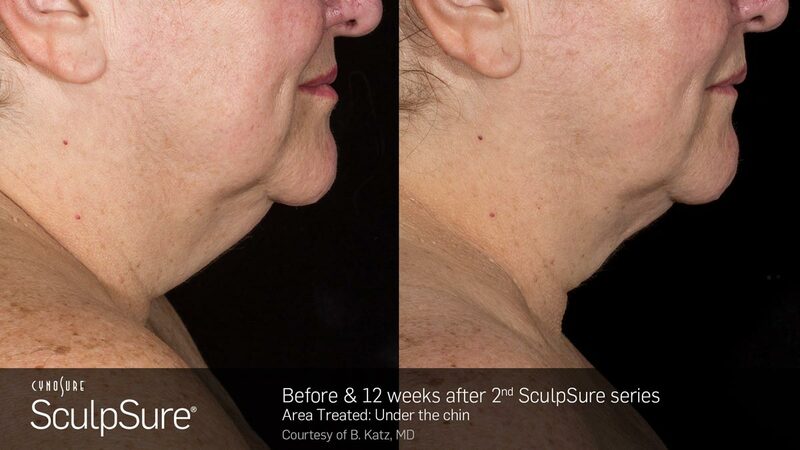 New Radiance Cosmetic Centers offer the latest non-invasive SculpSure for chin treatment laser technology. Our experts wield SculpSure technology to melt that wattle without surgery. 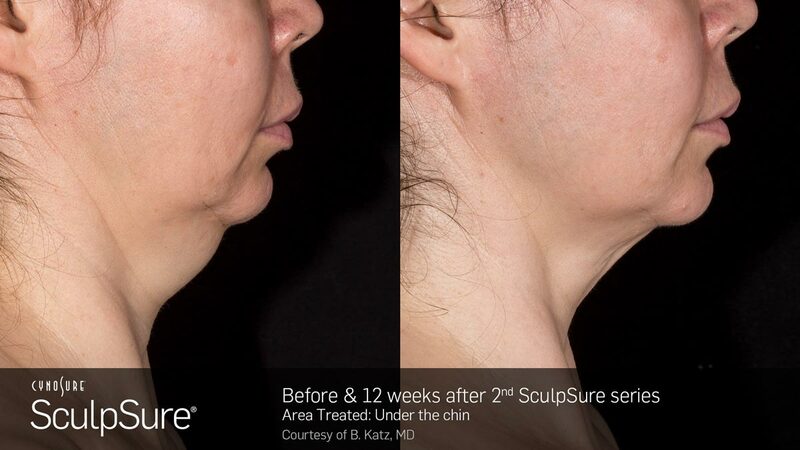 SculpSure can reduce or eliminate the appearance of double chin in as little as 25 minutes. Plus, there’s none of the downtime or recovery period associated with plastic surgery. 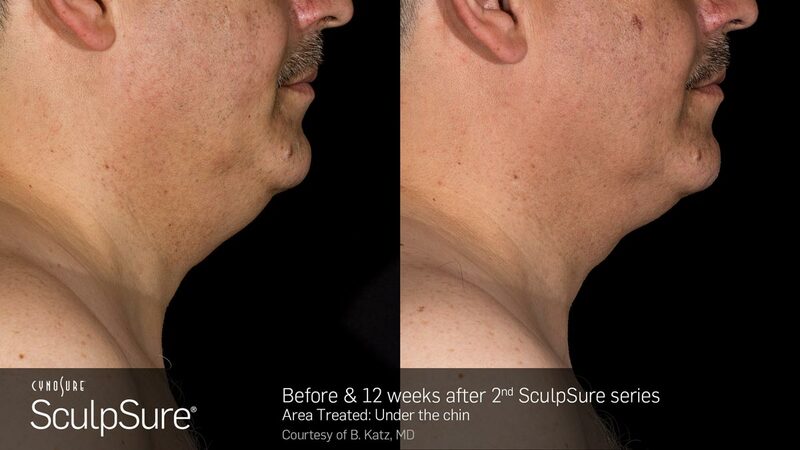 SculpSure can dissolve that double chin during your lunch hour. SculpSure for chin, neck and jawline is FDA cleared to eliminate fat cells. 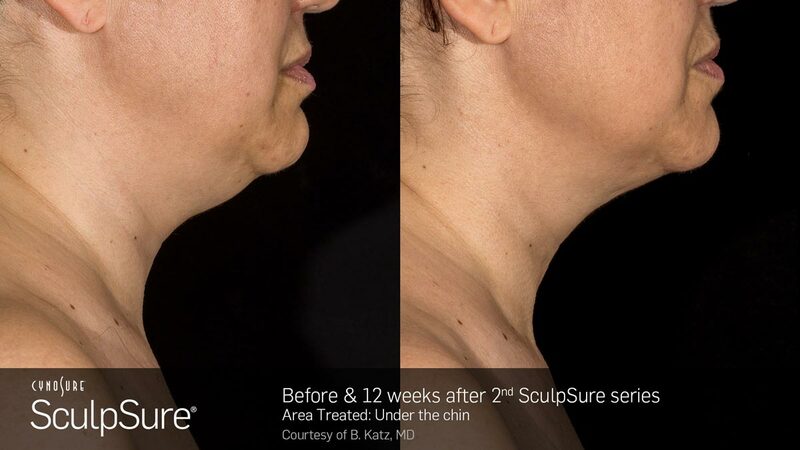 SculpSure clinical trials have proven this laser technology can result in up to 24% reduction of fat in the target area in only one treatment. New Radiance Cosmetic Centers has invested in the latest SculpSure technology. The new technology targets fat in the chin, neck and jawline. SculpSure is a laser-based treatment. It works by using heating and cooling that specifically targets the fat cells. The treatment causes the cells to naturally detach without impacting the adjacent skin and tissue! Your free consultation will include measurement of the treatment area. We will also develop a personalized treatment plan to achieve your desired goals for SculpSure chin and neck fat reduction. However much you wish to remove, SculpSure for the chin, neck and jawline at New Radiance Cosmetic Centers can achieve the complete results you desire. ProNox during the procedure for your comfort. No downtime or recovery period. What if multiple SculpSure chin treatments are needed to achieve my desired results? SculpSure for chin and neck is the same as SculpSure for other areas of the body. If you desire additional fat reduction, you can undergo additional treatments in the same area to eliminate more fat. Our staff can perform SculpSure treatments on the same area as few as six weeks apart. For some, a double chin is a combination of fat and loose skin. SculpSure does not treat loose skin since it is not fat. Your skin will gradually retract and tighten as the fat is eliminated after the treatment. However, if you already have loose skin, reducing fat will not tighten it. After SculpSure, we can tighten that loose skin with other procedures such as Exilis Ultra or Ultherapy. New Radiance Cosmetic Centers includes one free Exilis Ultra skin tightening treatment 12 weeks after your SculpSure procedure. We maximize your results by including this $250 value treatment for free! These treatments use RF or ultrasound technology to stimulate your body’s regenerative response to increase elastin and collagen production. This gently & gradually restores elasticity to the skin as well as its underlying tissues.